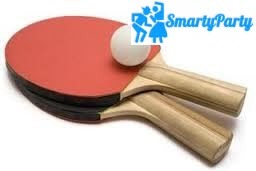 What you need to know to play a fun game of ping-pong Sometimes all you want to know are the basic rules to play a friendly match of ping pong. This section is for you. If you want more official rules, read the section below. The ball must rest on an open hand palm. Then it must be tossed up at least 6 inches and struck so the ball first bounces on the server’s side and then the opponent’s side. If the serve is legal except that it touches the net, it is called a let serve. Let serves are not scored and are reserved.